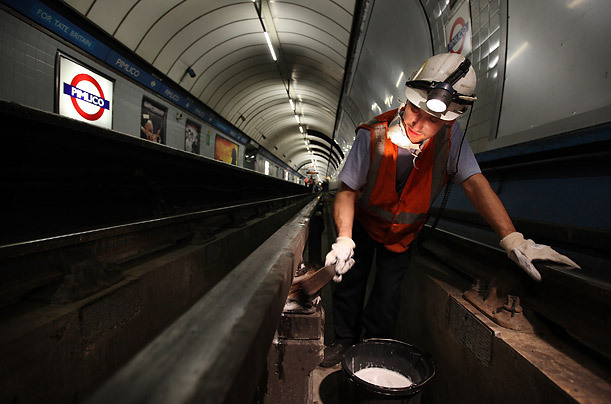 A worker cleans the ceramic insulator pots under the live rail at Pimlico. The London Tube was the first underground railway to operate electric trains. London’s Tube After Midnight: I realize this is Day 2 of featuring a gallery from TIME, but dangnabbit, it’s really interesting. Having been in some of those tubes during “moderate” weather, I can only imagine what these workers have to work through to keep those rails running. This entry was posted on Wednesday, January 21st, 2009 at 12:55 am	and is filed under Life, News, Photo. You can follow any responses to this entry through the RSS 2.0 feed. Both comments and pings are currently closed.